We depend on fresh water from two main sources - surface water and ground water. Surface water is the water found on the earth's surface such as oceans, lakes, streams, rivers, ponds and reservoirs. Of all the earth's surface water, 97 percent is too salty to drink because it's located in oceans and seas. Another 2 percent is locked in ice caps and glaciers. Only about 1 percent of the earth's water is fresh water to be used for agricultural, commercial, manufacturing, community and personal household needs. Ground water is water that is found underground in rock formations, caverns and sand and gravel beds. Groundwater is pumped to the surface through a well, which may be hundreds of feet deep. When the pump is running, water is drawn in through cracks in the rocks and up the well shaft. The groundwater level (the "water table") drops when water is pumped, but it rises again when the rain soaks deep into the earth's surface to replenish the aquifer. In the United States, ground water is the source of water for about half of the population. Our water supply operates on a delicate cycle of replenishment. 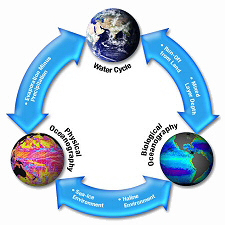 The cycle can be dramatically and irrevocably affected when we carelessly pollute our surface or ground water supply. Chemical pollution is a growing danger. Today, many toxic and potentially deadly chemicals threaten our water supplies. These chemicals can be a health risk even in very small concentrations. They enter our drinking water from industrial waste landfills and lagoons, septic tanks and cesspools, dump and landfill sites, mining and petroleum operations, pesticides and fertilizers used on farms and in home gardens, leaking underground storage tanks and storm water runoff. Research shows that many sources of ground water are polluted or at risk of pollution. Because ground water moves slowly, it can remain polluted for years. Please take care in how you dispose of household contaminants and hazardous chemicals, especially those applied directly to the ground. Buy only the amount of fertilizers, pesticides or other hazardous chemicals that you need so that you don't have to dispose of the leftovers. Read all the labels and follow proper disposal instructions. Be an informed consumer. Consider alternatives if any of the following words are on labels: caution, warning, danger, poison, flammable, volatile, caustic or corrosive. Don't dispose of hazardous wastes in storm drains, wastewater systems, creeks, alleys or the ground. Use organic lawn and garden alternatives that do not contain synthetic chemical poisons. Recycle your used oil, automotive fluids, batteries, and other products. To prevent all the water on earth from being used up and never replenished, water moves through a hydrologic cycle called the Water Cycle. It's nature's system for moving water through our environment so we can re-use it again and again and again. The Water Cycle begins as the sun heats land and water surfaces, causing the water from the earth's oceans, lakes, rivers, streams and reservoirs to evaporate. The evaporated moisture is carried into the atmosphere and eventually falls back to earth as precipitation from clouds. This precipitation can be in the form of rain, hail, sleet or snow. The water runs into our rivers, lakes and oceans and is absorbed by the soil. As it seeps into underground formations called aquifers, it replenishes our groundwater supply. The Water Cycle never ends. The water supply we have today is the same that existed when the earth was formed millions of years ago.